Only a tiny fraction of the $1 trillion grocery market has moved online. On-demand delivery is prohibitively expensive for retailers and it is extremely important for consumers to pick their own foods. For decades consumers have had the convenience of their local greengrocer, milkman, and ice-cream vendor coming door to door, yet it never made economic sense to scale – until now, by leveraging driverless technology. This spring, Robomart, a California-based company is teaming up with grocery chain Stop & Shop for a trial run of their world’s first driverless grocery store service in Boston, Massachusetts. All the users of this service need to do is summon the mobile grocery store using a mobile app. When the store turns up outside their door, they can simply tap in a code on the vehicle to unlock its doors, grab what they like from the selection of everyday items and meal kits, and that’s it. 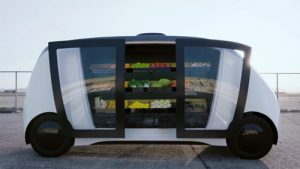 In summer 2018, Nuro, a tech startup, teamed up with supermarket giant Kroger for an autonomous grocery delivery service to customers in Scottsdale, Arizona. To use the service, customers had to place an order with Kroger via a smartphone app. Back at the depot, the staff loaded up the autonomous pod’s secure lockers with the customer order and sent it on its way. When the “R1” autonomous delivery pod arrived at the scheduled stop, the customer simply tapped in a code to open the locker and access their groceries.